My neighbor's wonderful purple climber (which I featured in my last post) has me quite smitten. I've been so taken with it this year that I decided I HAD to find out what it was! As I've driven around town, I've seen glimpses of it in other landscapes. And then after publishing the last post, I received all of your comments asking the same question, "What is it?" Taking the bull by the horns, I went down to our local nursery today and found it! 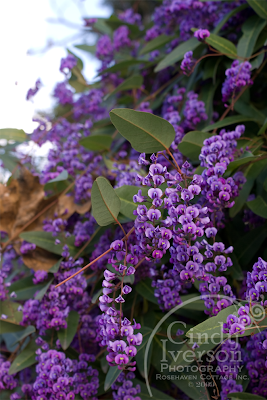 It is a Hardenbergia violacea. Its common name is "Happy Wanderer". The label said that it blooms from fall to late spring and is a great climber for winter color. Well, I have photographic evidence above that this is true. I am so enamored with it now, that I will for sure be getting at least one for the back garden. I just need to find a better specimen than the ones I saw today which were a bit too straggly and sad looking. I WILL find one though. And it WILL be going in to the back garden. It's now no longer a question of "if" but "when". I love this *happy wanderer*! What do you suppose... would it bloom through the winter here? Hmmm, maybe not! I just love purple. This year I want to add some lavendar and purple salvia. Those will thrive here in winter land! I'm in love with it. Do you think it is hardy? Probably not, since I have never seen it before.....sigh. Oooh! Thanks for the name! BTW, you have an award on my blog. Go check it out when you have some time. I just knew I wouldn't be able to grow that in Missouri! Thanks for checking it out! Hmmm...I wonder how it would do in a pot on my balcony...I have the perfect wall for it. How lovely that would be to have some beautiful colour out there during the bleak winter months. It is stunning....I'm going to have to do some research to see if it will grow in my zone 8 garden...and if camels like it, lol! It's a beautiful climber and I love the color purple in the garden. Happy hunting! Too bad it won't grow over here in the frigid northeast! I'll just have to enjoy yours vicariously when it grows. Hope you find a healthy specimen. It is so beautiful! I would be tempted to grow it even as a house plant. :-) Is it scented at all? No wonder you love them. The flowers are a gorgeous colour. They remind me of Wisteria. I hope you find a good specimen soon! !